One of the first concepts for an underwater rowing boat was drawn up by an Englishman named William Bourne in 1578, but it was not until 1620 when the plans were eventually realized by Dutchman Cornelius Drebbel. 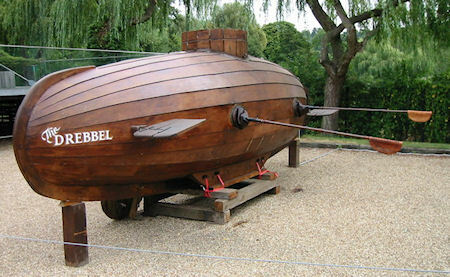 Drebbel's submarine, built of wood and propelled by oars, could stay underwater for several hours. Floats with attached tubes brought air from the surface to the crew below. He demonstrated the submarine's capabilities by diving on the river Thames and staying underwater for three hours.